ZURICH – A friend who is a psychologist once told me that addiction to coffee isn’t measured by how many cups one drinks but, rather, by the depth of emotion that one feels for coffee. Well, I love coffee. Hot, rich, smooth, black coffee. In large quantities. 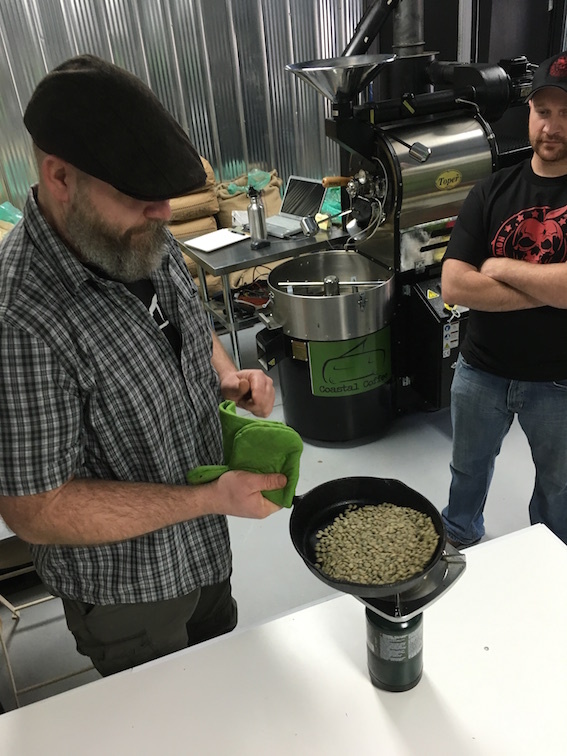 So when the invitation came to attend Coffee Roasting 101 at The Coastal Roastery in Zurich today, I was excited. 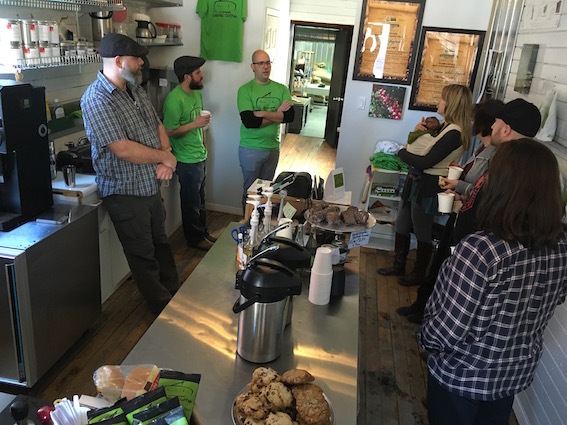 Many people are familiar with Coastal Coffee Company, with its green logo of a stylized pop-up top Volkswagen van, a regular at many farmers markets in Huron County. Perhaps not so many people are familiar with its coffee shop in downtown Zurich, where there’s always a pot or two of coffee and some baked goods available, along with everything you need to prepare a good pot of coffee. At the back, beyond the retail shop, burlap sacks of green beans – which are really the seed of a coffee cherry – grown by micro producers in Nicaragua, Columbia, Rwanda, Peru or some other exotic country sit ready for the gleaming Toper brand roaster in the centre of the room. Today, the four of us in this class are not going near the commercial roaster. 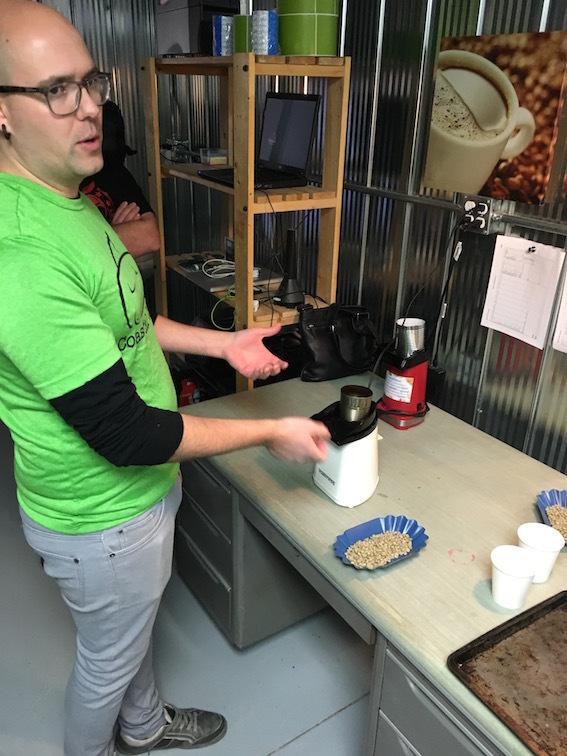 Instead, we’re learning to roast micro batches of coffee using a few methods that adapt to our own kitchens or campfires. The class ratio is a phenomenal 1:1, with staff sharing their considerable knowledge and skills. Jason Wiebe kicks off the demonstration with a cautionary note that a butane burner should not be used indoors and a popcorn maker should not be modified in any way. 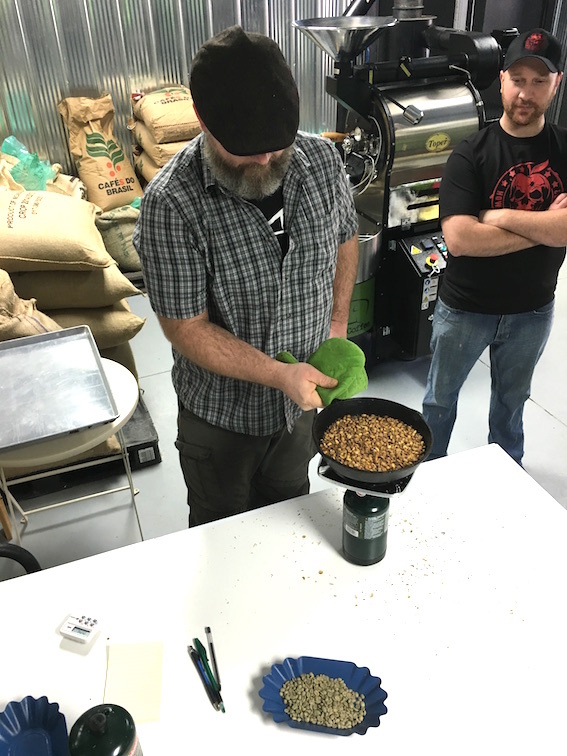 Then he fills a dry cast iron skillet with 250g – that’s one cup, for those of you still on Imperial measurements – and we watch as he flips the beans like a chef making an omelette, chaff floating into the air. In time, the beans turn from green to yellow to deep brown. And there is a cluster of cracking sounds, like sluggish popcorn, at two intervals in the process. We’re told the green beans smell like wet grass in the first few minutes, then like hay, then like fresh bread as the sugar in the beans start to caramelize. When they’re done, Jason flips them onto a baking pan to cool. 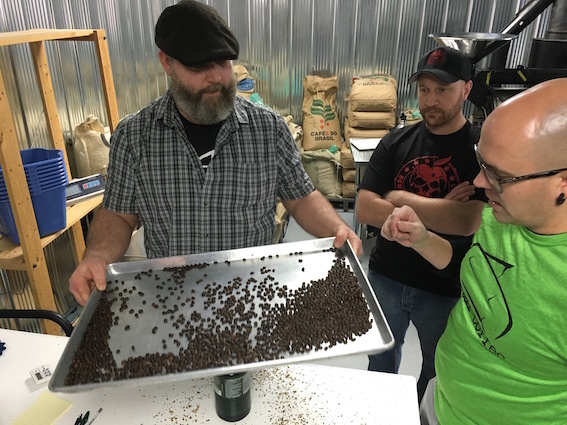 To watch a short video of coffee beans in the skillet, check out their Facebook video post on Jan. 23. 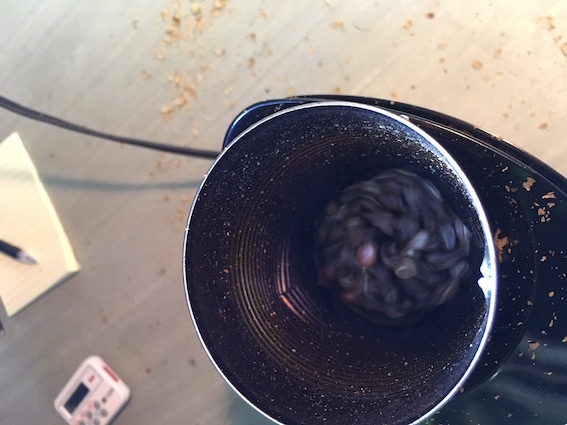 Ben Gingerich takes an even smaller portion of beans, just 80g, and pours them into an old, sturdy popcorn maker that’s been modified with the addition of a steel can missing both top and bottom fitted like a miniature smoke stack. The hot air tosses around the beans and every now and again he gives the popcorn maker a shake. We shine a penlight onto the beans, checking their colour because we can’t hear the beans crack above the noise of the machine. In a shorter time than it took to skillet roast the beans, this batch is done. There is a third process for roasting coffee at home, but it seems to be the least favourable choice: using a relatively pricey electric drum roller with presets. 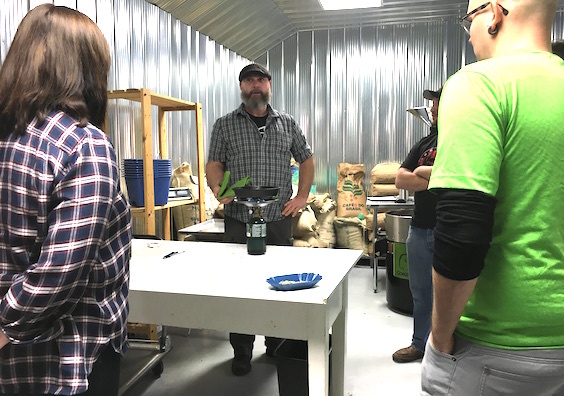 At the end of the two-hour class, we grab homemade cookies and yet another cup of coffee, we are given green beans to roast at home, and we get a sample of the beans we roasted. Even if my sample of green beans never hits a skillet or popcorn maker, I have a much deeper appreciation for coffee, which is a big part of my day. When: Saturday, Feb. 27, starting at 1:30 p.m.
ST. JOSEPH – Golden sunshine, golden pancakes and golden maple syrup – what more could a person ask for? All of these and more were available at the Breakfast in the Park in the small community of St. Joseph Just north of Grand Bend on Highway 21. This summer event is organized by the St. Joseph & Area Historical Society and takes place in the shady St. Joseph Memorial Park on the corner of Bluewater Highway and Hensall/Zurich Road. All proceeds from the breakfast go towards the maintenance of the park. 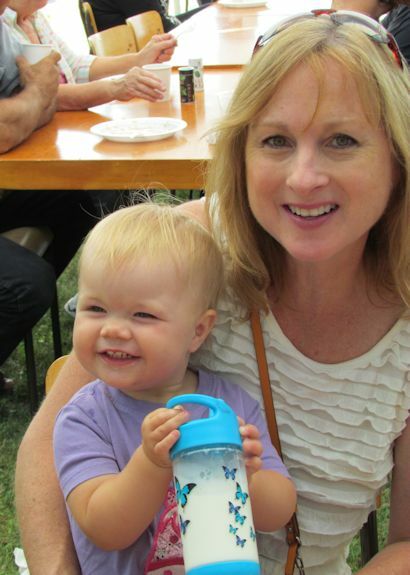 16-month-old Brinley from Zurich enjoys breakfast with her grandmother. The breakfast menu featured ruby red strawberries and juicy, freshly sliced cantaloupe, hot scrambled eggs, thick sausages fresh off the “barbie”, and golden pancakes that could be drizzled (or drowned) in sweet, golden maple syrup. To quench your thirst, there was hot coffee and cold juice. All of this was served with smiles and friendly banter. The cost was a “Free Will Offering”, which I thought was a great idea and easy on the pocket book. You could take your heaping plate and sit at one of the many tables and chairs that had been set up under canopies or make use of one of the park’s picnic tables. It was nice to look around and see singles, couples, families, young and not so young enjoying one another’s company in these pleasant surroundings. As its name suggests, the park is a memorial to St. Joseph, who is the patron saint of Canada. 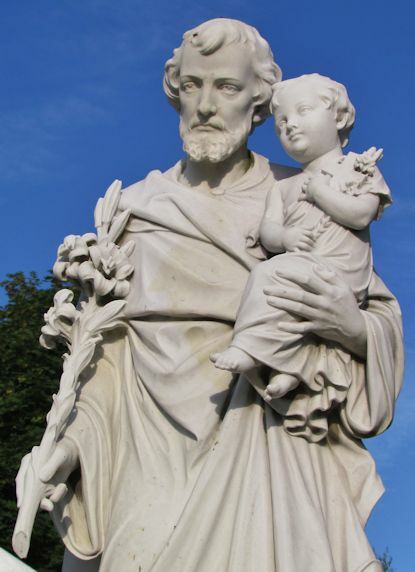 The park features a statue of St. Joseph holding Baby Jesus. The exact spot for the location of the statue was chosen by Brother Andre (now known as St. Andre of Montreal) in 1917, however, the memorial did not get built until 1972. The park also features a memorial to Brother Andre of St. Joseph’s Oratory in Montreal. He was famous for his good works among French Canadians and was credited with thousands of reportedly miraculous healings. The park is also dedicated to the memory of the French Canadians who left Quebec in the early part of the 19th century and settled in the area now called St. Joseph, the only French settlement between Windsor and Midland. A Heritage Walkway contains the names of many of those original families, names such as Masse, LaPorte, and Cantin, with perhaps the settlement’s most famous citizen being Narcisse Cantin, aka “The Father of the St. Lawrence Seaway”. There are also a number of plaques situated along the walkway, which provide some very interesting local historical facts and pictures. The St. Joseph & Area Historical Society works hard to collect and preserve the local history and has created a wonderful website. Its Breakfast in the Park is a nice outing for the family where you can fill your tummies with yummy food and your heads with some interesting local history. Psychic medium Kelly Elson reads the crowd of women gathered at Part II Bistro in Blyth. Photos courtesy of Darlene McCowan Photographer. BLYTH – Tonight I heard from my dad and my grandmother, which is weird because they’ve both been dead for more than a decade. As generally happens when family gets together, they wanted to talk about the people we have in common – my aunts and uncles, my mom and my two brothers – and pass on a few hellos. 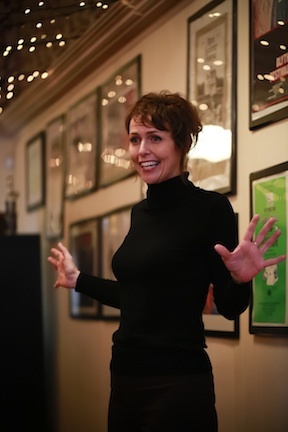 The messages played out kind of like a cross between 20 questions and charades, as they communicated through Goderich psychic medium Kelly Elson during a group reading held at Part II Bistro in Blyth. From what I gather, Dad showed her a symbol that looks like the Roman numeral II, which in the language of the dead (my words, not hers) can mean he’s trying to talk about twins, someone who is a Gemini, somebody’s birthday, or the parallel of two things falling close together. After more questions, it was possible that something happened on a holiday, or two somethings happened on two holidays. My father was diagnosed with small cell lung cancer on Labour Day weekend in 1999. And he died on Victoria Day weekend in 2000. She also said he kept coming back to a Canada flag. What I didn’t tell the medium was that my dad made a stained glass maple leaf set into a stepping stone, which was donated as the centre piece for the IODE Maple Leaf chapter’s public garden in Goderich. After he died, someone stole that stepping stone. She asked too if lily of the valley, those delicate white flowers found in the woods, mean anything to me because dad kept pulling up handfuls of them. Flowers were one of my dad’s many passions. He loved trilliums, jack-in-the-pulpits and ferns from the forests, so he probably liked lily of the valley too. I don’t know for sure. Kelly made her way around the room, telling the women gathered for this dinner what she saw – someone named John who smelled like a woodstove, about a hundred people gathered to pass on their thanks to a nurse, a father-in-law whose image appeared in black and white to signify he’s been gone for awhile, a grandmother holding a child in a pink blanket, a woman in an intense game of poker, and the images just keep coming. The accuracy of some of her statements was quite astounding. There was instant intimacy in a room full of strangers and some of what was said should stay within the confines of that dining room. 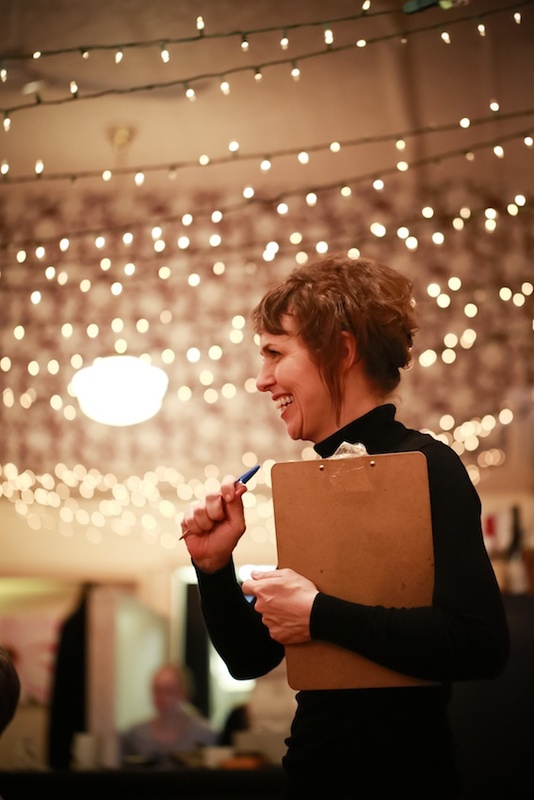 Peter and Sarah Gusso, of Part II Bistro, were wonderful hosts, setting up the dining room in long rows of tables so that clusters of friends sat alongside strangers for the evening. The three-course meal included: spinach and bosc pear salad, with gourmet trail mix, Blyth spiced goat cheese and a maple-citrus-mustard vinaigrette; pineapple chicken atop a bed of coconut rice with volcano rice, all topped with a fresh salsa; brownies with coulis, plus a table tray of lemon tarts, coffee cakes and strudels. Part II Bistro has a schedule of wine, Scotch or beer tastings, live music and other events. Check them out on Facebook or online. 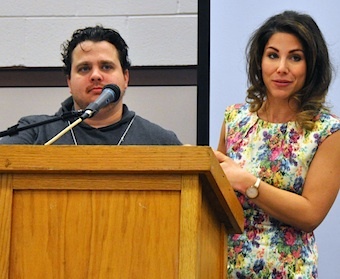 Keynote speakers Rebecca Wise & Victor Barry of Cottage Life’s INNvasion’s reality TV show, talked about the growing trend for nostalgia & urged participants to think of all senses – smell, sounds, touch, and tastes. Photos by Jenna Ujiye. BLUEWATER – Tourism is the world’s largest industry with revenues of over $500 billion including travel, tourism and hospitality businesses. In Huron County, tourism is a major economic driver as we welcome over one million visitors to our region each year. 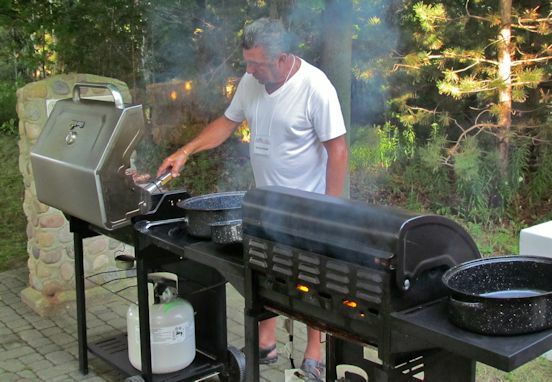 Recently, the Huron Tourism Association held its annual industry event. Over 100 tourism business operators gathered at the Community Centre in Zurich to listen, learn, and interact with their peers. By bringing together tourism operators to network and to sharpen skills, to learn about the County’s tourism assets and to talk about emerging travel trends we work to provide the best possible experience for our visitors. Boxes and bundles of new brochures are distributed to tourism operators throughout the county in time for the tourism summer season. Heritage sites and stories, food, events and opportunities for outdoor adventures were all highlighted during three familiarization trips in the host municipality of Bluewater. Tourism operators gained a deeper awareness of just how rich in tourism assets that region of the county is. 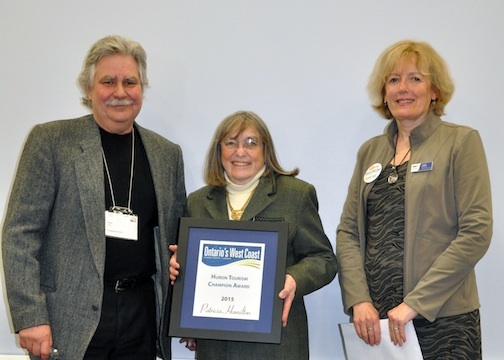 Huron County Museum and Historic Gaol Curator Patricia Hamilton (centre) receives the Tourism Champion Award from past recipient Jim Lee of Cinnamon Jim’s and Huron County Tourism Co-ordinator Cindy Fisher. addition, the newly re-designed 2015 Ontario’s West Coast Travel Guide was available as were the County’s specialty brochures including Fishing, Hiking and Cycling guides – each one a valuable tool that drives business in the County each season of the year. 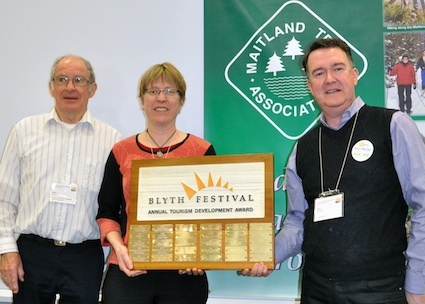 Roger Goddard and Susanna Reid, of the Maitland Trail Association, accept the Tourism Development Award from John McHenry, an HTA board member. celebrates its 40th anniversary this year, was awarded the Tourism Development Award for demonstrating leadership, creative invention, partnership initiatives, community impact and excellence in the tourism industry. In Huron County, we’re open and ready for business. We look forward to welcoming you to Ontario’s West Coast for adventure, theatre, festivals, events, and food. You’ll find heritage and culture sites that share stories of our deep rural roots and you’ll find new friends offering you a warm rural hospitality. Visit ontarioswestcoast.ca today to plan your visit today. Winterfest draws people of all ages to a variety of activities. GODERICH – This weekend, the community of Goderich is hosting a wintery pick-you-up to help you and your family push through the winter blahs. Winterfest has grown and evolved from its humble beginnings more than two decades ago into an event that’s anchored by some key activities with a bit of something new every year. 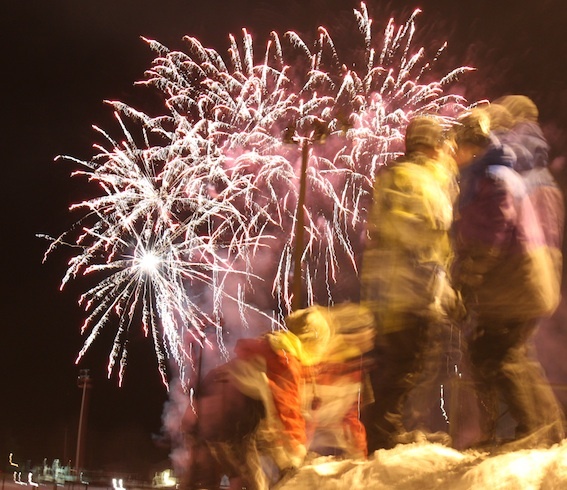 Every visitor to town becomes an honorary Goderichite during Winterfest, whether they’re walking the lantern-lit trails and warming up with a mug of hot chocolate afterwards, sampling the chili in a cook-off of secret recipes, watching nighttime fireworks light up the sky, or taking part in any number of activities lined up for the three-day event, Feb. 6 to 8. I can remember that first Winterfest more than two decades ago. It was a big financial gamble for a group of very keen organizers, who booked a high-energy rock and roll band to play at the Knights of Columbus Centre as the feature event. If it stormed that evening, we were bound to take a loss on the event. However, it didn’t storm enough to keep people home that night and tickets were sold out in a snap. People came dressed in ‘60s costumes and danced and danced and danced that evening. And there was enough money to keep the event going in future years and draw a loyal following. 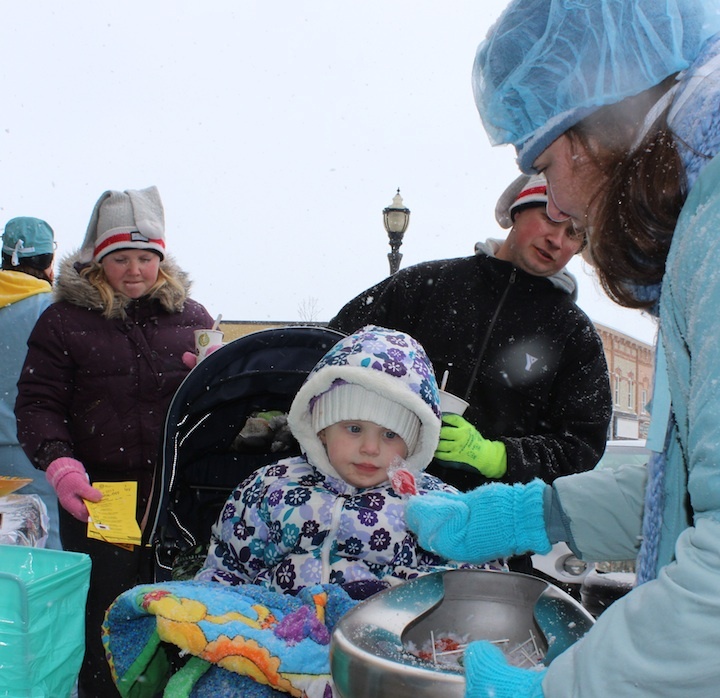 One of my favourite events over the years is the Saturday chili cook-off, with folks wandering the downtown Square trying to juggle Styrofoam bowls, a bun and steaming beverages while bundled up against some blustery weather. Tomato sauce and ground beef slopped onto mitts and napkins blew away in the wind. It’s a wonder we ever got our ballots cast for the best chili. That challenge continued through the years, probably weighed against the festive spirit that comes with meeting friends and neighbours on busy, chilly sidewalks. This year, however, the Rotary club is trying a new location, with chili competitors lining the indoor streetscape of the Maitland Recreation Centre. Some of the braver competitors, clinging to tradition, will set up outside the centre’s front doors. One of the newer events is the Saturday evening fireworks show by PyroWorld in the town’s agricultural park. The spectacular show is set to music, with the low-level fireworks reflecting on the snow, which makes for great photographs. Anyone who isn’t interested in braving the outdoors for hot chocolate at 6:30 p.m. and fireworks at 7 p.m. can catch the musical presentation on 104.9 The Beach, starting at 7 p.m.
“There are a variety of indoor and outdoor activities through the weekend,” said Wanda Keith, who is the town’s festival and special events co-ordinator. 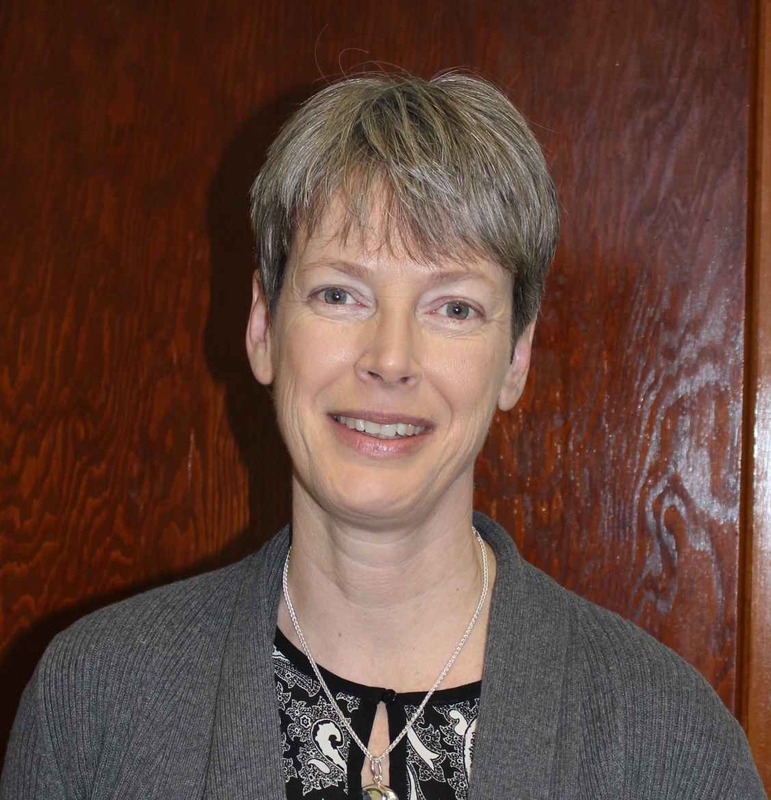 “The variety of things happening is phenomenal. And it’s all local organizations putting these events on,” she said. Another event that’s new this year will be the Goderich Makers Market on Saturday morning. It’s just like a visit to the farmers market, only it’s wintertime and it’s indoors, with produce, local meat, baked goods, soups, crafts and soaps. In addition, the local horticultural society will bring the promise of spring by hosting a seed swap, with seeds available to swap or purchase by donation. For a full list of events, click here. One additional event didn’t make it to the poster, which is the free skate from 1 p.m. to 3 p.m. on Saturday at Victoria Park’s outdoor rink, as long as the weather’s cold enough to keep the ice frozen. Hot chocolate and cookies provided by Zehrs. Huron has sooo many rivers and ponds that can be explored. The Huron County Fishing guide has a map of all of the waterways along with the types of fish and tips and tricks in it. This year we have decided to add a paddling layer on to the fishing map. I do have a kayak, but typically spend my time out on the nine mile close to my house! Does anyone out there have a favourite place on the river to paddle? We will be putting the guide together in the next couple of months, so if you can send us some ideas, we’d love them! Check out the current guide below! 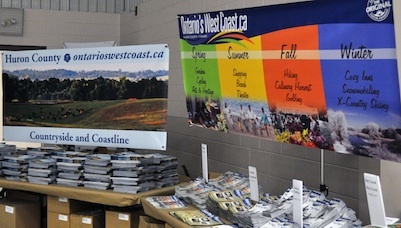 Top 5 reasons to carry the Ontario’s West Coast Vacation Guide in your car! 1. Every tourism business is Huron County is in it. 2. It is filled with information about fun things to do. 3. There are maps for Cross Country Skiing and Hiking Trails, Natural Areas, Beaches and roads. 4. If the internet goes down you will be able to find what you need! 5. Everybody is doing it.